The demonstration last Saturday night in downtown Jerusalem, during which protesters shouted for a revolution (ma-ah-peh-cha) as the cure for privatization (hafrata), felt more like a carnival than a protest march. Sophisticated, ironic and funny slogans and signs created the ambience of clever middle class folks having fun dumping on the government. I don't have money for felafel. 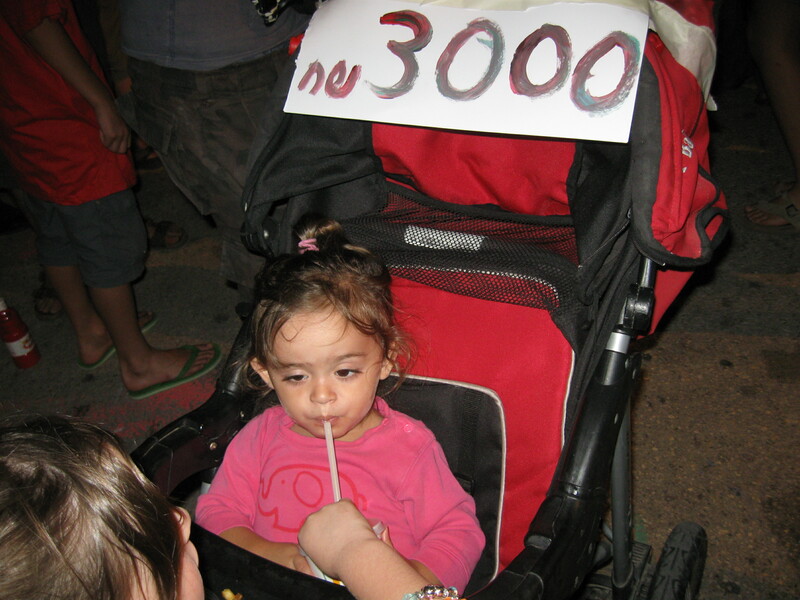 At the Jerusalem march one young family put a sign on their baby’s carriage: NIS 3,000. Upon questioning, the father told me this is the cost of day care (7:30-4) for kids under three. This family has two kids under three. Both parents work and like so many at the march, they can’t afford living in Israel. In the popular children’s alef-beit (ABC) song, aleph stands for ohel (tent) and beit stants for bayit (house.) But in the slogan, sign and protest t-shirt, beit, which everyone knows stands for house, stands for ohel (tent). Sadly, young people cannot afford to buy their own homes in the current economy ruled by a few tycoon families. This makes the tent cities a perfect concretization of the people’s economic distress. Another slogan was a play on the root tzadi, dalet, kuf. 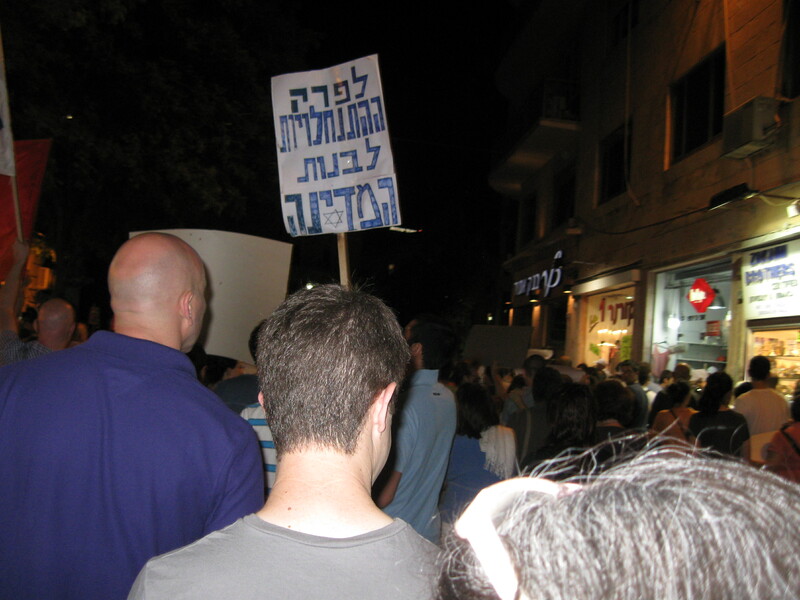 “We want Tzedek (justice), not Tzdaka (hand-outs). What kind of justice? Tzedek hevrati (Social justice.) When do we want it? NOW!” Isaiah Amos Jeremiah and Micah were probably kvelling in their own tent cities in the sky. 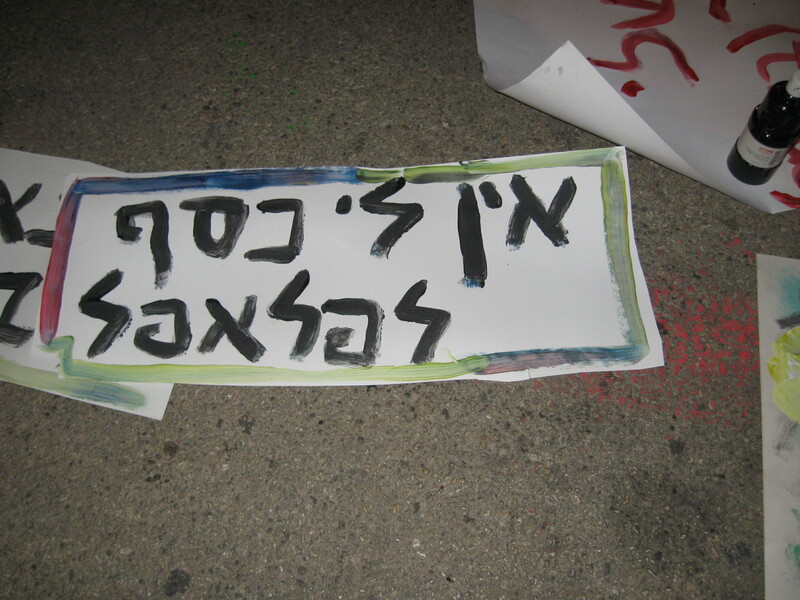 This entry was posted in Israel and tagged protest march, slogans, social justice. Bookmark the permalink. It seems that Israel was once a lot smarter about social matters than it is today. When my kids were growing up there were affordable daycare centers for children of working mothers. It also seems that the social and economic ills cannot be corrected without a political solution. The money exists, but it is being misdirected across the Green Line. Judy, thanks for the post. Esther, your comment is spot on. There’s no solution without a big change in the way resources are distributed. Until now the issue of subsidization of the occupied territories has been sidestepped by most of the protests, for various reasons. At the demonstration tonight I won’t carry a clever sign but will carry the awareness that now is the time for a peaceful return to the green line, on all sides, and to economic, sectarian, and social balance. Thanks, Rena, for your comment. I look forward to more Issraelis acquiring that awareness you mention.